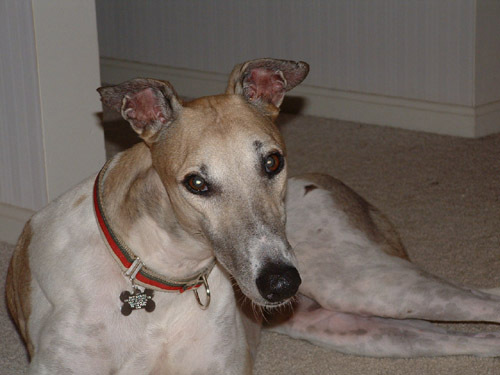 We are so sorry to report that our FFGR, Inc. family has lost yet another greyhound. We got notice from Marilyn and Ned Wright that their greyhound Murray lost his battle with lymphoma in July. He was nine years old. He was diagnosed with lymphoma back in March and at that time Marilyn contacted us to tell us about the diagnosis. There was little they could do at the time except treat the pain and give him the best life for the time he had left. That time came in July. Marilyn and Ned adopted Murray in September 2006. At that time they had another greyhound named Bailey. They told us that they also lost Bailey in July. We often ran into Ned and Marilyn on our travels around Boonsboro and Middletown. They live in Middletown, a short drive from us. They always talked about how much they loved their hounds. It is always difficult to face the loss of a beloved hound, let alone two within a short period of time. But we know that Ned and Marilyn loved their greyhounds and they both had a wonderful and loving home. Rest in sweet peace Murray (and Bailey).